create a great poster on the wall. 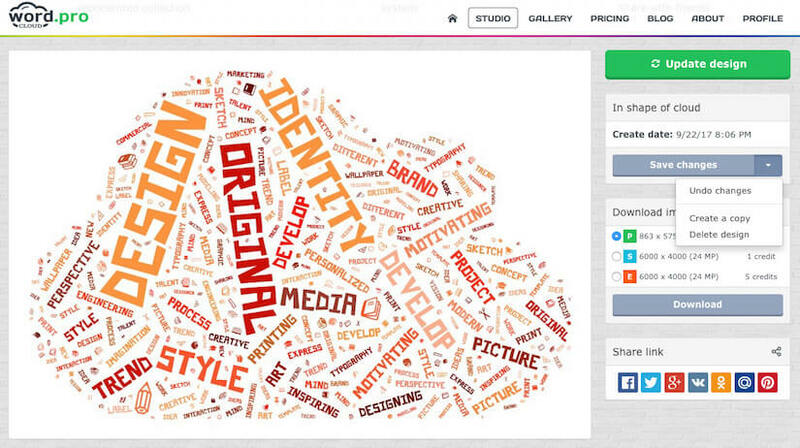 Regardless of the purpose you want to use pictures made of words, the WordCloud.pro will help you implement all of your ideas quickly and easily. Use the detailed instruction to see all the features of the service. To create a new design, select the "Studio" from the main menu. First of all, you should decide which design you like. 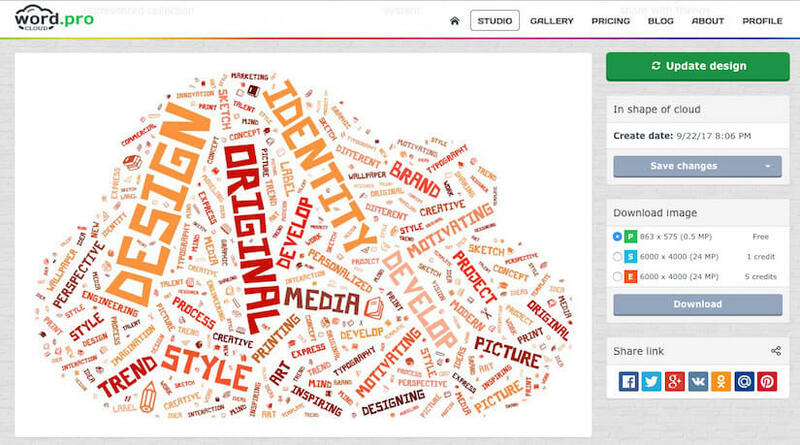 What do you want your word cloud to look like? Select the suited sketch from the represented collection. To find a suitable design, you can use a filter or search by name. To filter you should select one or more appropriate tags. If you want to exclude a collection with a specific tag from your selection, click on the tag again. To better view the design, increase the sketch by clicking on it. Some sketches are presented in several options. Go to the next option by clicking on the image or using the "forward" / "backward" pointers. Click the "Select" button if you like the sketch. It will become the basis of your picture of the words. If you don’t like this sketch, just close the window to pick up something else. The selected sketch will be highlighted with a green line. 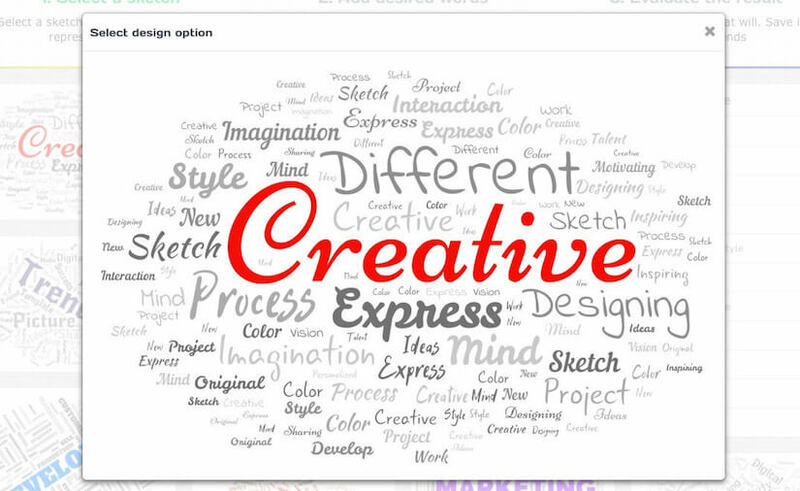 After you have selected the design of the sketch, it's time to adding words from which your cloud will consist. Go to the second stage "Add desired words". The words you add at this stage will be repeated in the picture in random order, forming a picture with the selected sketch. You can use only one word, then the image will consist only of its repetitions. But the more words you add, the better the picture you will get. Remember that words are the colors of your picture, make it brighter! 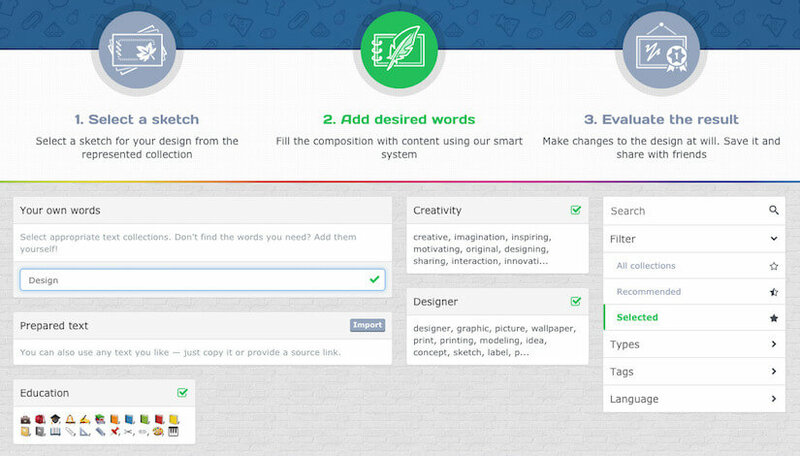 You can make a list of your own words and phrases, add selected text or use prepared collections. If you want to use your own words, enter them into the field "Your own words" and add to the list by clicking the mouse button or the "Enter" key. Each line should contain just one word or phrase. If you have a ready list of words, you can add it entirely to the field "Prepared text". Click the "Import" button and paste the previously copied text into the appeared window. The words in the text can be separated by spaces or commas, the editor will automatically break the text into words that will become the basis for your word cloud. You can create a picture using any text from a book or an article the same way. You can also add text by simply copying the link and pasting it into a special editor field. Please, note that all words on the page by this link will be used. 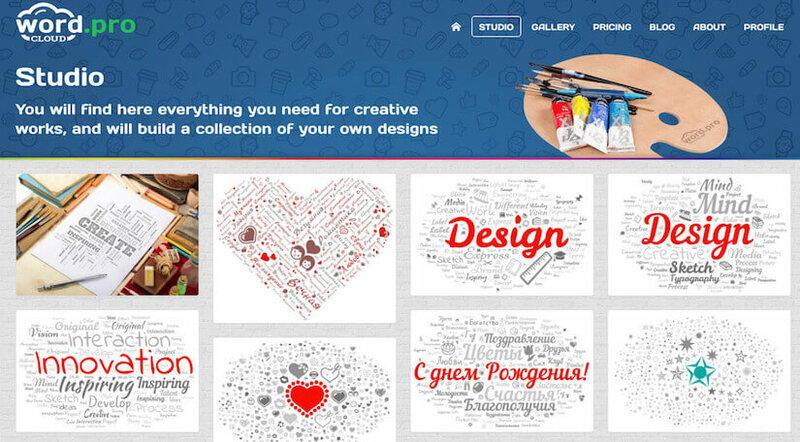 You can use the collections, which we have prepared specially for you. To do this, choose one or more collections to add to your word cloud. If you know exactly what collection you need - use the search. Also you can use filters by types, tags and language for selection of collections. All prepared collections are divided into two types - icons and words. You can make your picture more informal if you add several collections of icon-emoji. 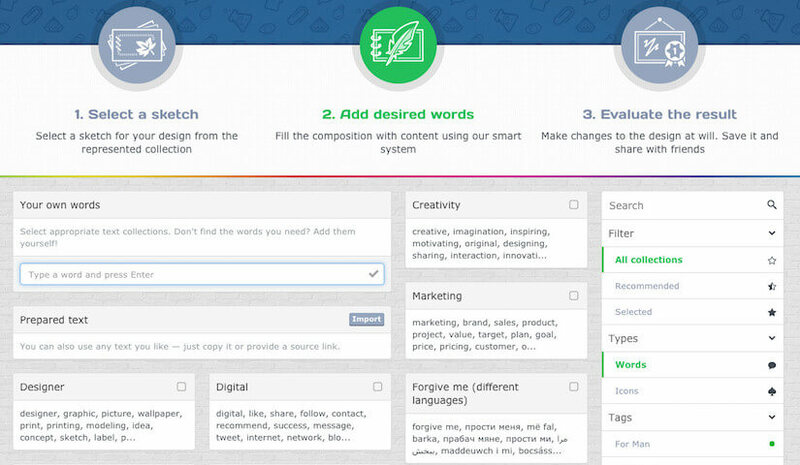 To select collections by tags, select one or more suitable topics. 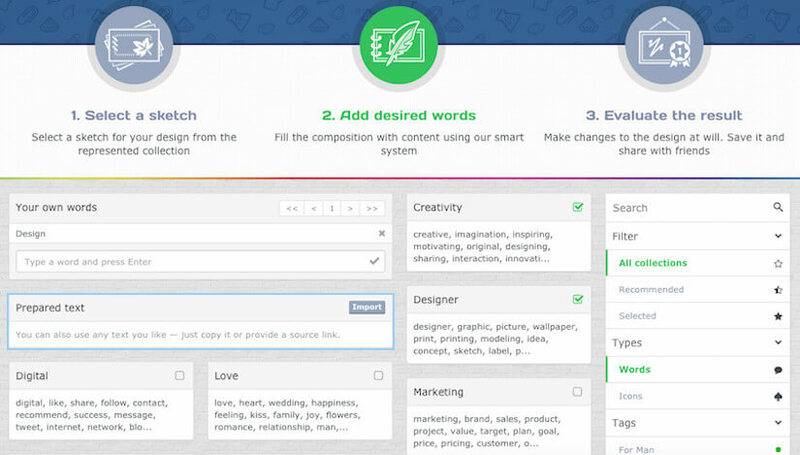 You can add a collection of words to the cloud of words in different languages. 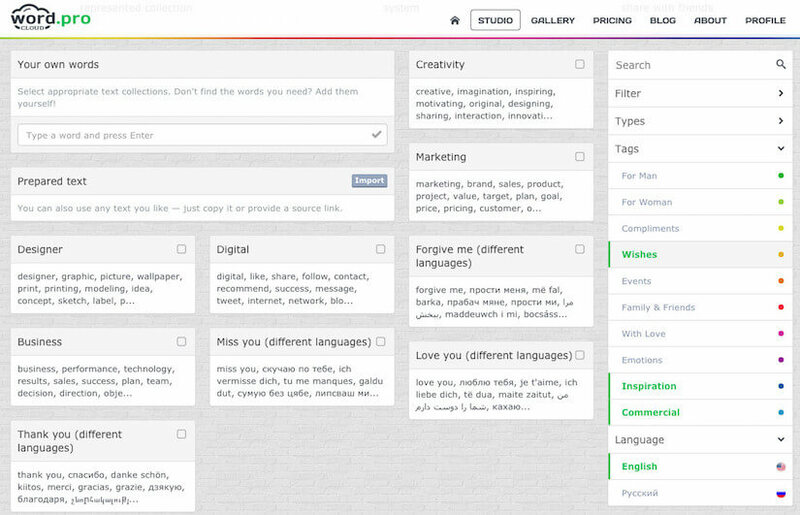 Switching the language is at the bottom of the filter panel. Tick off all suitable collections to add them to your word cloud. You can add any words and phrases that are not included in the collection. All words will be placed randomly in the picture, but the words from your list have priority over the words from the collections. It's time to see what picture you created. To do this, go to the third stage "Evaluate the result". 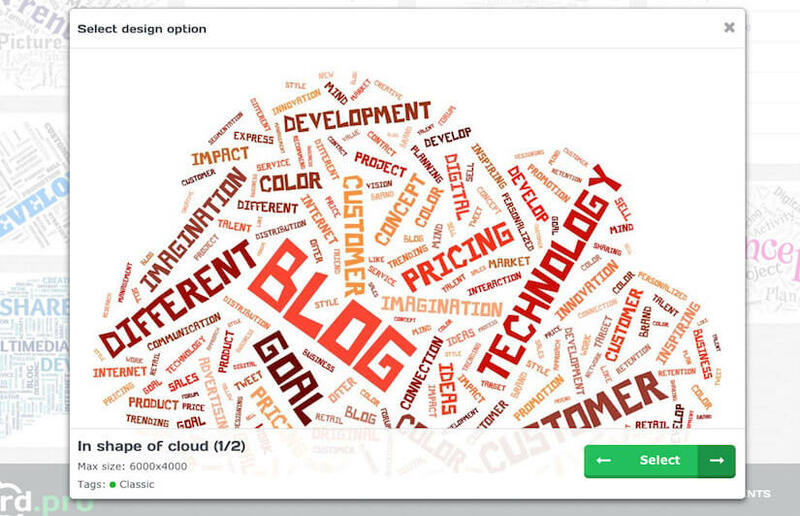 Click on the button "Update design", and you will see your word cloud. To change the random order of words in the picture - update the design once more. All words will be arranged in a different order, and the cloud will be different. To add or remove some words, go back to the stage of adding words, make the necessary changes, then re-evaluate the result. You can also change the design of the sketch by returning to the first stage, the selected words will be saved. If you like finished picture you should save the changes. You can also undo changes and return to the previous version, create a copy or delete the design. Save the changes to download the finished word cloud. Also you should select the license format based on your usage goals. A personal license allows you to download a low-resolution image for free and allows to use the picture only for personal non-commercial purposes. Standard and advanced licenses allow you to download high-resolution images and use pictures for any purpose, including commercial. More information about licenses and prices you can find on the "Pricing" page. After selecting the license format, click "Download". If you choose a paid license, you will see information about image payment. The download will begin after your payment confirmation. If the credits on the current balance are not enough, you will be offered options for buying a credits. If you choose a free license, download will start automatically. After you have downloaded the image, you can use it according to the purchased license. We hope that you liked the WordCloud.pro service and you come for new ideas and beautiful word clouds again! Surprise your friends and family with presents, create your own unique design.